With a sizeable gap behind him, Pierre Gasly said he was delighted to grab the extra point for setting the fastest lap in Sunday's Chinese Grand Prix. With more than a pit-stops worth of time between himself and Daniel Ricciardo in seventh spot, Gasly pitted late on in a bid to set the fastest lap around the Shanghai International Circuit. This season, setting the fastest lap earns an extra point, should the driver finish in the top 10, which Gasly did in sixth. “I’m happy to score my first fastest lap in F1," he said afterwards. "We saw that we had quite a big margin behind us in the last few laps, so we decided to go for it and have an extra pit stop which worked." 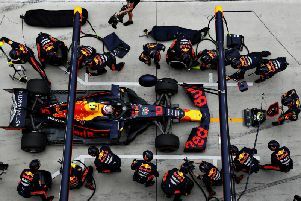 His second points finish for Red Bull Racing was his best since arriving at the team in the winter. It was a fairly lonely race for the Frenchman though, well adrift of Charles Leclerc in fifth. Gasly added: "During the race I tried to keep the rhythm, take care of my tyres and improve my feeling with the car. I’m slowly getting more confident, I think we take one step every weekend but of course I would like to take three every time. "There is still work for me to do for the next race but the good thing is that I know what I need to improve and what I can do better. We are quite happy to finish in the points and take the extra point for fastest lap with us." For team-mate Max Verstappen, it was a similarly quiet race as he claimed fourth for the second race in a row. Pulling off the undercut to leapfrog Leclerc's Ferrari, Verstappen was not able to keep up with the Mercedes duo and Sebastian Vettel's Ferrari, while remaining comfortably ahead of the second Ferrari. The Dutchman, who sits third in the championship, said: "We planned a good strategy to undercut a Ferrari and stay ahead, so we definitely maximised the result to finish fourth ahead of Charles. "I had a good battle with Seb when he came out of the pits on colder tyres which was good fun. That was my one shot and I tried but after that you could see that we didn’t quite have the pace to fight him to the end.